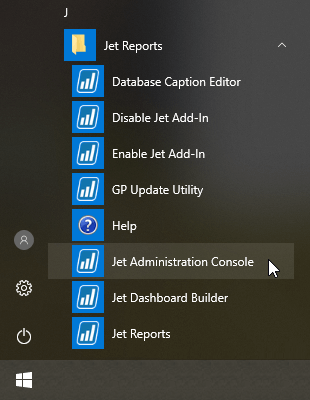 The Jet Administration Console is a user interface which makes it easy for administrators to create and manage the information in the Services Database when the Jet Service Tier (a set of Windows services used by Jet Reports and Jet Analytics dashboards) is used. Users must be on Jet Reports version 2015 or later. 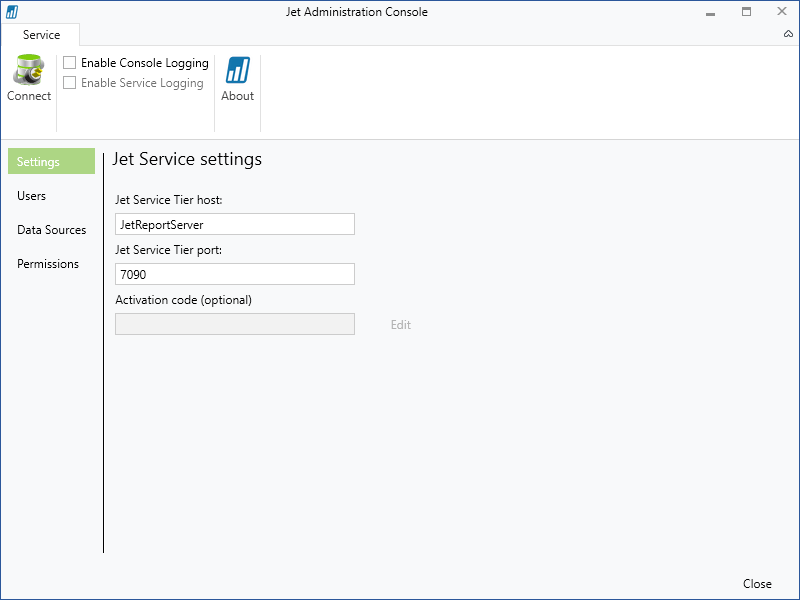 If you have previously used Centralized Settings with Jet Essentials 2012 R2 or earlier and upgraded your settings by installing Jet Essentials 2013 or 2013 Update 1, your settings were upgraded when you installed the Service Tier for Jet Reports 2015 or higher. If you have been using Centralized Settings with Jet Essentials 2012 R2 or earlier and have *not* subsequently upgraded to Jet Essentials 2013 or 2013 Update 1, you must perform that upgrade prior to use the Jet Service Tier. Once properly upgraded, you will see your Users, Data Sources and Permissions in the Jet Administration Console. Type the name of the server where your Jet Services database and the Jet Service Tier are running. You may need to modify the default port number if it was changed during installation of the Service Tier. Click the Connect button on the ribbon. 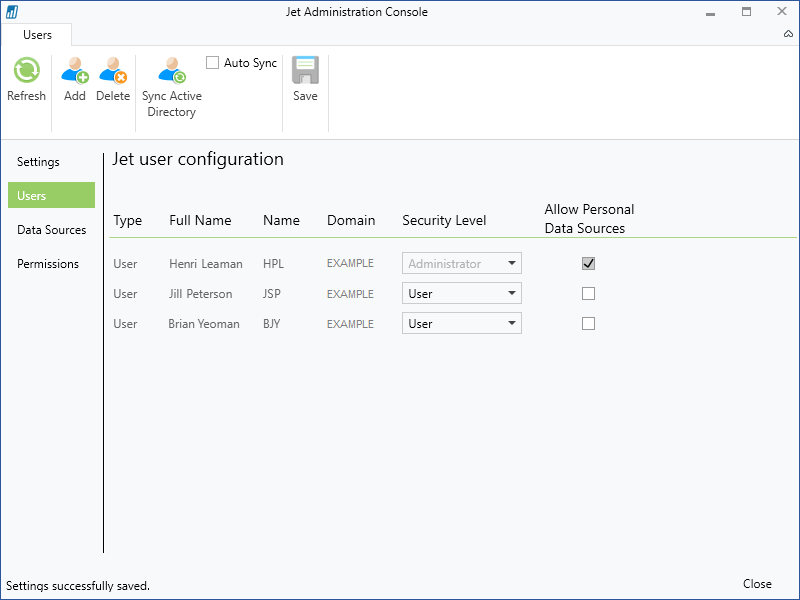 A User is a person who can access data sources defined in the Jet Administration Console to design and/or run reports using the Jet Excel add-in. A user may be defined as an individual Active Directory user or Active Directory group. Defining users as groups enables an administrator to grant permissions to a group of users, greatly reducing security workload. Defining users as groups in the Jet Administration Console does not change the Jet licensing model, in which a Designer or Viewer is defined as an individual. 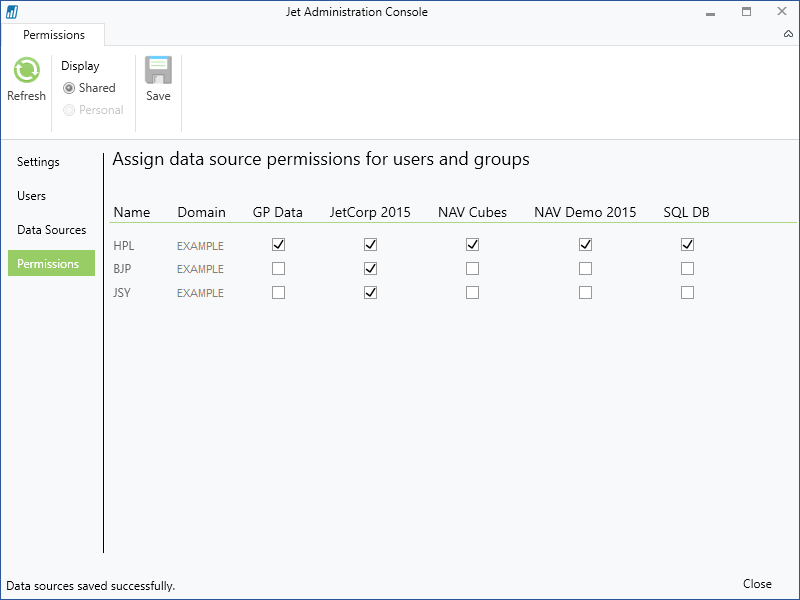 Administrators can add, modify, or delete: users, data sources, and/or permissions using the Jet Administration Console. An Administrator can grant other users Administrator rights by changing the users’ security level. The individual who installed the Jet Service Tier has Administrator rights by default. You can allow users to create Personal Data Sources. These are data sources that other individuals would not be able to see or use. 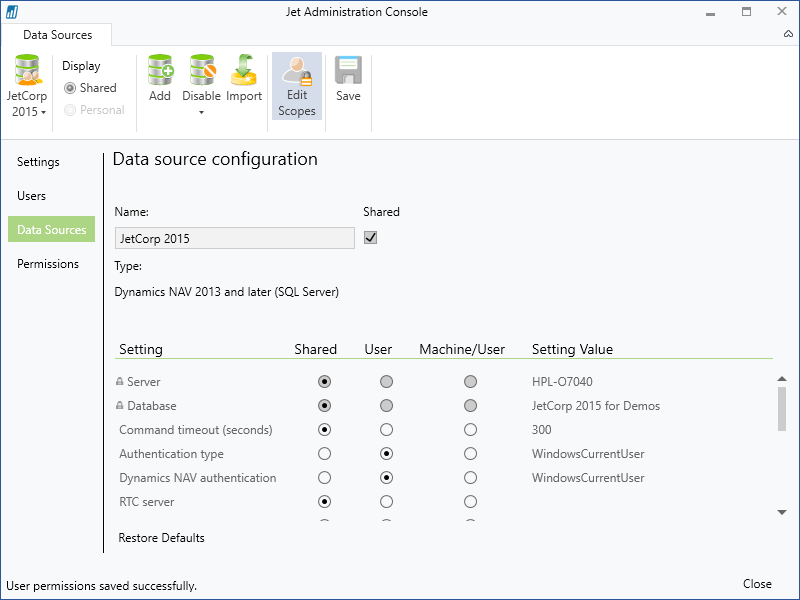 Personal Data Sources are created inside the Jet Excel add-in. The data source connection properties are stored in the Services Database and are specific to the individual. Select the Data Sources tab to add, manage, and remove data sources. If you have previously defined data sources in the Jet Excel add-in, you can import them. You will first need to export your data sources from the Jet Excel add-in. 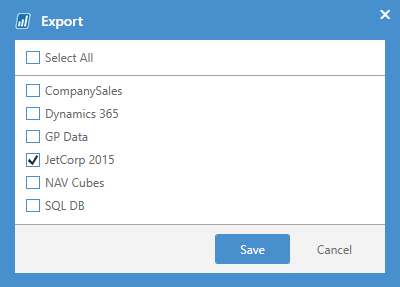 Navigate to the export file you saved, open that file, and select the data sources you want to you want to import. Each setting on a data source has a ‘scope’. Scopes can be modified by selecting Edit Scopes. When you have finished editing the scopes of your data source settings, click the Edit Scopes button, again. You can provide a user access to a data source by clicking the appropriate box. A check mark in the intersecting box indicates that a user has permissions to access the data source connection properties. Providing users with access to the data source connection properties does NOT provide them access to the data sources themselves. Users will still need read permissions on their respective data sources.